CARITA BEACH, Indonesia — A tsunami believed to be triggered by a volcanic eruption killed at least 222 people in Indonesia during a busy holiday weekend, sweeping away hotels, hundreds of houses and a group of people attending a beach concert. More than 800 people were reported injured after the tsunami hit around the Sunda Strait at 9:27 p.m. Saturday, the Disaster Management Agency. At least 28 others were missing, but the toll could continue to rise because some areas had not yet been reached. Scientists, including those from Indonesia’s Meteorology and Geophysics agency, said Sunday that the tsunami could have been caused by undersea landslides or those occurring above sea level on the Anak Krakatau volcano’s steep outside slope following the eruption. The volcano’s name translates to “Child of Krakatoa,” a volcanic island formed over years after one of the largest eruptions in recorded history occurred at the Krakatoa volcano more than a century ago. The scientists also cited tidal waves caused by the full moon. Dramatic video posted on social media showed an Indonesian pop band named “Seventeen” performing under a tent on a popular beach at a concert for employees of a state-owned electricity company. Dozens of people sat listening at tables covered in white cloths while others bobbed to the music near the stage as bright strobe lights flashed and theatrical smoke was released. “I had to run, as the wave passed the beach and landed 15-20m (meters, or 50-65 feet) inland,” Norwegian Oystein Lund Andersen wrote on Facebook. The self-described photographer and volcano enthusiast said he was taking pictures of the volcano when he suddenly saw a big wave come toward him. Azki Kurniawan, 16, said he was undergoing vocational training with a group of 30 other students at Patra Comfort Hotel when people suddenly burst into the lobby yelling, “Sea water rising!” He said he was confused because he did not feel an earthquake, but ran to the parking lot to try to reach his motorbike. By the time he got there, it was already flooded. The 305-meter (1,000-foot) -high Anak Krakatau volcano, located about 200 kilometers (124 miles) southwest of Jakarta, Indonesia’s capital, has been erupting since June. In July, authorities widened its no-go areas to 2 kilometers (1.2 miles) from the crater. Nine hotels and hundreds of homes were heavily damaged. Broken chunks of concrete and splintered sticks of wood littered hard-hit coastal areas, turning beach getaways popular with Jakarta residents into near ghost towns. Vehicles tossed by the waves remained belly up in the rubble or were lodged in the air under collapsed roofs. Debris from thatch-bamboo shacks was strewn along beaches. Indonesia, a vast archipelago of more than 17,000 islands and home to 260 million people, lies along the “Ring of Fire,” an arc of volcanoes and fault lines in the Pacific Basin. Saturday’s tsunami rekindled memories for some of the massive magnitude 9.1 earthquake that hit on Dec. 26, 2004. It spawned a giant tsunami off Sumatra island in western Indonesia, killing more than 230,000 people in a dozen countries — the majority in Indonesia. Indian pilot Bhavye Suneja’s body was cremated in Indonesia on Friday. Indonesian authorities have identified the body of Indian pilot Bhavye Suneja who captained the ill-fated plane that crashed into the sea on October 29. He was cremated on Friday. “Indonesian authorities have confirmed identification of body of Capt.Bhavya Suneja. The remains will be handed over to the family in presence of @IndianEmbJkt today. My heartfelt condolences to the bereaved family,” tweeted external affairs minister Sushma Swaraj. His body was cremated in Indonesia on Friday. “His parents, wife and in-laws are there. The body was handed over to the family Friday and cremated the same day,” said Rohit Dhingra, cousin of Bhavya’s wife. The Lion Air flight, with 188 fliers and crew on board, crashed into the sea off Java, minutes after taking off from Jakarta. A government volcanologist said it’s possible the eruption of Mount Soputan, on the island of Sulawesi, was accelerated by Friday’s 7.5 magnitude temblor. 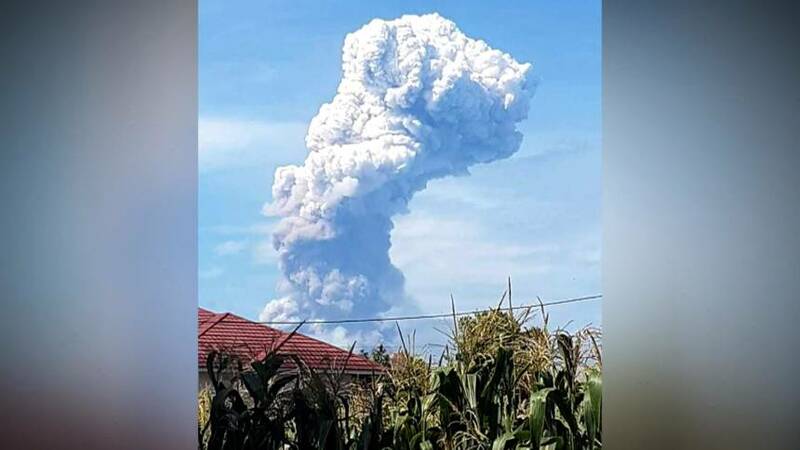 “It could be that this earthquake triggered the eruption, but the direct correlation has yet to be seen,” Kasbani, the head of Indonesia’s Vulcanology and Geology Disaster Mitigation agency, told online news portal Tempo. Kasbani, who uses one name, said volcanic activity had been increasing at Soputan since August and began surging Monday. No evacuations were immediately ordered after Wednesday’s eruption, which sent ash 19,700 feet — more 3.7 miles — into the sky. 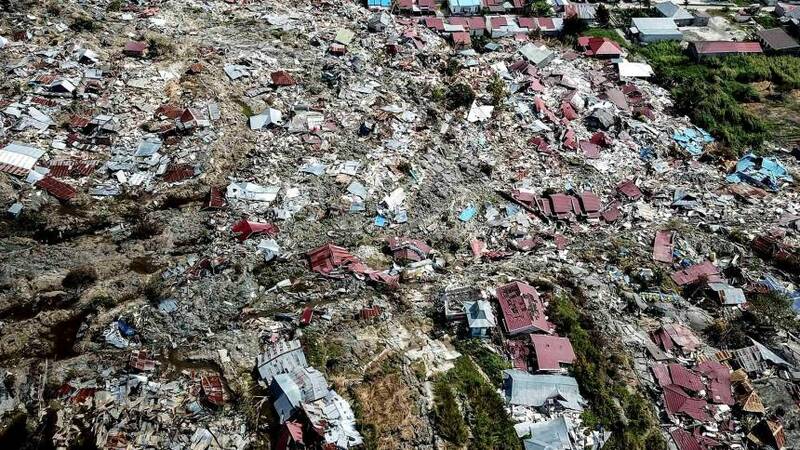 PALU, Indonesia — Indonesian authorities were still desperately working on Tuesday to get food and other aid to victims of the devastating earthquake and tsunami which struck last Friday. Drone video has revealed the widespread destruction from the twin natural disasters, and the confirmed death toll reached almost 1,300 on Tuesday morning. That number was still expected to climb as some of the hardest-hit areas are reached, and as CBS News correspondent Ben Tracy reports, more than 60,000 people have been forced from their homes. Tracy was in the hard-hit town of Palu on Tuesday where rescuers were frantically digging through mud and rubble, searching for survivors. The situation in Palu is desperate. There is very little water, electricity or gas. As the town digs a mass grave for victims, survivors have resorted to looting stores for food and thousands are flocking to the damaged airport, hoping to get out. When Tracy and his team arrived in Palu on Tuesday, they saw thousands of people camped out on the airport tarmac, desperately hoping that one of the cargo planes bringing in aid will deliver them from the hell that is now their home. Tracy spoke to one woman who had been waiting outside with her 8-month-old baby girl for three days. She said she was finally expecting to board a plane on Tuesday, and she was “absolutely delighted and thankful to God” for it. As Tracy asked her how her family was coping, the ground started shaking as another aftershock hit the battered region. For the beleaguered residents who have just been through a nightmare, it is extremely frightening to have the ground start shaking again — especially as they sit under a structure at the airport to try and shelter from the sun in the 90 degree heat. It has been four days since the earth violently shook when the massive 7.5-magnitude quake struck, triggering a tsunami nearly 20-feet-tall which smashed right into Palu. Heavy machinery has finally arrived to aid the rescue effort, said Tracy, but it was quickly turning into a grim recovery operation, rather than a rescue mission. In one part of Palu, the earthquake shook the ground so violently it basically turned the soil into quicksand and swallowed everything on top of it. Rescue workers told Tracy that they believed as many as 70 bodies could be buried under the rubble at the one site alone. But there are still signs of hope. On Monday night a 38-year-old man was pulled alive from the rubble of a building in Palu. He was able to talk to the rescuers who spent three hours extricating him from the huge slabs of concrete. Sadly that kind of story was becoming increasingly rare by Tuesday. One rescue worker showed Tracy the big sheet of white paper on a wall, where they note the victims found in their small search area. On Tuesday they found seven more bodies. Introduction In 1979 the Federated States of Micronesia, a UN Trust Territory under US administration, adopted a constitution. In 1986 independence was attained under a Compact of Free Association with the US, which was amended and renewed in 2004. Present concerns include large-scale unemployment, overfishing, and overdependence on US aid. History The ancestors of the Micronesians settled over four thousand years ago. A decentralized chieftain-based system eventually evolved into a more centralized economic and religious empire centered on Yap. Nan Madol, consisting of a series of small artificial islands linked by a network of canals, is often called the Venice of the Pacific. It is located near the island of Pohnpei and used to be the ceremonial and political seat of the Saudeleur dynasty that united Pohnpei’s estimated 25,000 people from about AD 500 until 1500, when the centralized system collapsed. European explorers — first the Portuguese in search of the Spice Islands (Indonesia) and then the Spanish — reached the Carolines in the sixteenth century, with the Spanish establishing sovereignty. It was sold to Germany in 1899, conquered by Japan in 1914, before being seized by the United States during World War II and administered by the US under United Nations auspices in 1947 as part of the Trust Territory of the Pacific Islands. During World War II, a significant portion of the Japanese fleet was based in Truk Lagoon. In February 1944, Operation Hailstone, one of the most important naval battles of the war, took place at Truk, in which many Japanese support vessels and aircraft were destroyed. On May 10, 1979, four of the Trust Territory districts ratified a new constitution to become the Federated States of Micronesia. Palau, the Marshall Islands, and the Northern Mariana Islands chose not to participate. The FSM signed a Compact of Free Association with the United States of America, which entered into force on November 3, 1986, marking Micronesia’s emergence from trusteeship to independence. Politics The Federated States of Micronesia are governed by the 1979 constitution, which guarantees fundamental human rights and establishes a separation of governmental powers. The unicameral Congress has fourteen members elected by popular vote. Four senators — one from each state — serve four-year terms; the remaining ten senators represent single-member districts based on population, and serve two-year terms. The President and Vice President are elected by Congress from among the four state-based senators to serve four-year terms in the executive branch. Their congressional seats are then filled by special elections. The president and vice president are supported by an appointed cabinet. There are no formal political parties. In international politics, the Federated States of Micronesia has always voted on the side of the United States with respect to United Nations General Assembly resolutions. A strong earthquake struck the Indonesian tourist island of Lombok on Sunday. The latest quake triggered a brief tsunami warning. A Balinese temple is seen partially collapsed in Badung in Bali island on August 5, 2018 after a major earthquake rocked neighbouring Lombok island. MATARAM, Indonesia (AP) — A powerful earthquake struck the Indonesian tourist island of Lombok on Sunday, killing at least 39 people and shaking neighboring Bali, one week after another quake on Lombok killed more than a dozen. 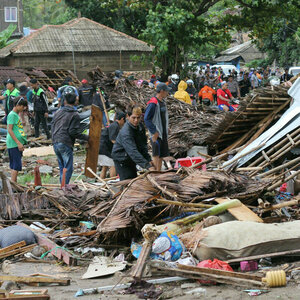 Muhammad Rum, head of the disaster management agency in West Nusa Tenggara province, which includes Lombok, told Indonesian TV the death toll had risen to 39. Earlier, officials had said at least three people had died. JAKARTA, Indonesia — A strong earthquake struck Indonesia’s popular tourist island of Lombok on Sunday, killing at least three people and briefly triggering a tsunami warning one week after another quake in the same area killed more than a dozen. The latest quake caused people to flee their homes and move to higher ground. Authorities said the quake may have caused some damage. Najmul Akhyar, district chief of North Lombok, told MetroTV that there was an electrical blackout so he was unable to assess the entire situation, but that at least three people had been killed. The U.S. Geological Survey said the magnitude 7.0 quake struck early Sunday evening at a depth of 6 miles. Its epicenter was about 1 mile east-southeast of Loloan. A map from the U.S. Geological Survey shows the epicenter of the 7.0 earthquake that struck Lombok Island in Indonesia on Sunday, Aug. 5, 2018. Indonesia’s Meteorology, Climatology and Geophysics Agency issued a tsunami warning after the quake struck. The warning was lifted later Sunday. He said the quake was also felt in parts of neighboring Bali island.